freeroll, there’ll be loads of goodies up for grabs! their exciting promotions lined up for the month. As soon as you opt in to the promotion once, you are eligible to enter as many promotions as you want. Good luck! You must opt in to Titan Poker’s 6 Year Anniversary to be eligible for prizes. - Players will be divided into four divisions according to their VIP levels. Each division will have their own 24 hour races. - All the winners from each race will qualify for the Heads-Up Championship. - The winners from each 24 hour race will receive ranking based on their race number that they won. - Each division will have 3 rounds of competition and the winners from each division will move on to two heads-up semi-final matchups. - The two semi-final winners will battle each other in the final for the Heads-Up Championship and the main prize! Titan Poker is giving out mystery giveaways every week for the entire month of September. The mystery prizes will be revealed on the Titan Poker web site at the start of each week. appearance at the tables and this is your chance to play with them! They will be seated at designated cash game tables on the following dates: Sunday, September 18 - Marvin Rettenmaier and Sunday, September 25 - Sam Trickett from 19:00 - 22:00 GMT. tables. Players will be seated on a first come, first serve basis. The Team Titan Pros will also be playing the weekly $200,000 Guaranteed tournament with an added $200 bounty. Generate at least 60 Points in September and you can take part in the $6,000 freeroll on Thursday, October 6 at 19:00 GMT. 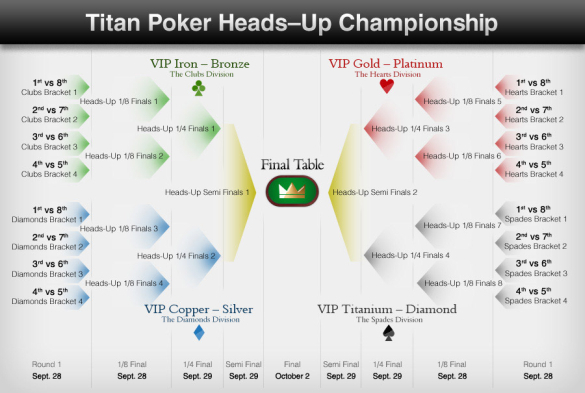 The tournament can be found in the “Special Offers” tab in your Titan Poker lobby.